I found this at the bookstore today and thought it was really cool. The projects are indeed wacky and the illustrations are excellent. Be warned: there aren't really 50 unique projects in this book...I would say it's more like a dozen. Also, these are contraptions in the Rube Goldberg tradition. Though the title insists they are "useful", they are not -- just silly, complicated, mechanical fun. 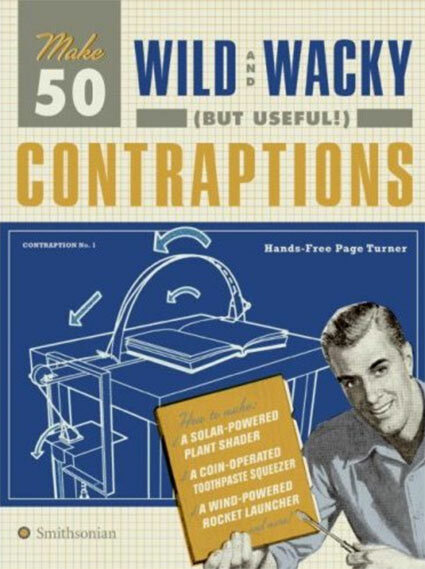 Here's where you can get Make 50 Wild and Wacky (but Useful!) Contraptions. Thanks for the tip. I ordered one today.